Hi all, I am popping in to share a bit of Caring Hearts update. For the US section alone, we have collected 50,287 cards and we still not finish opening & counting all the boxes. Canada, Australia and UK total is around 7600. This is the pile of packages I got on 11/21 and on 11/23 I got even more than this. So, needless to say we really are working hard behind the scene to get all these cards sort out and packaged for the nursing homes. I literally spent the whole Thanksgiving week & weekend just working on this (well, outside my full time job , as I do still have to show up at work... hah!). On Friday and Saturday, I had a couple friends showed up and helped me stuffing all the cards into the envelope and packing them. This pic below is what left after I packed about 50 boxes of large and medium size USPS box. As you can see, I definitely didn't get to host Thanksgiving dinner. ;) This is basically our dining table, extended to the max. That's me with the first batch of 50 boxes. And, we're not even close to finish. Hubby smartly took the pic from long distance as I have no make up and was worn out from the day work. Due to this overwhelming results, please be patient for the prize winners announcement. We have to make sure all the list completed before we can do the announcement. To all that contribute, thank you, we are working as hard and as fast as we could. Based on previous years results, we didn't expect it to get this big. 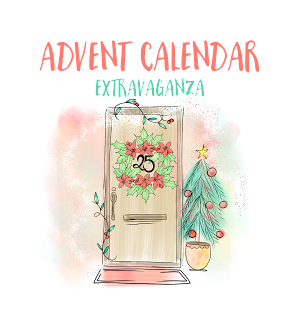 It's awesome, but it also lots of work, so most likely we won't announce the winners till end of next week. Our priority at this time is to get all the packages sort out and get the packages ready to be shipped to the nursing homes. I wish we could email you all one by one to confirm that I received your packages, but that's just not possible. I mean we probably have close to one thousand people sending in cards (as I say we're still counting). 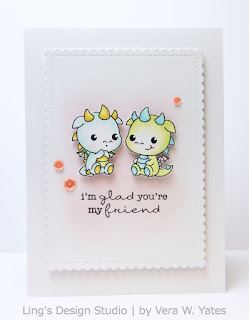 Hi peeps and welcome to a fun collaboration between The Ton and So Suzy Stamps. 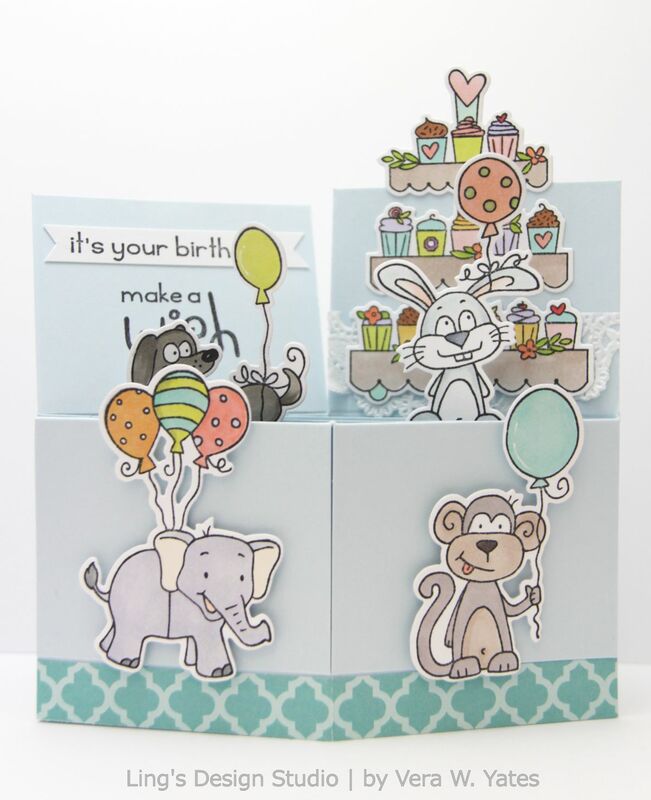 We are showcasing the styles of both stamp companies and the versatility of the designs of each. 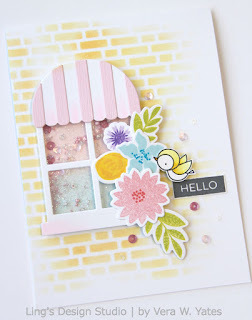 Each designer has created fun projects so be sure to hop along to see all the gorgeous inspiration. 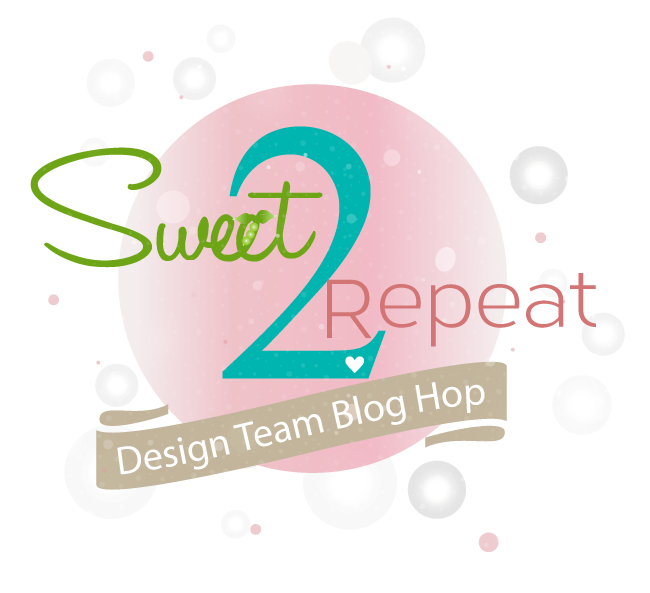 The hop continues until Wednesday and some of us designers will be creating and posting for each day of the hop. Be sure to follow us and check back the next couple of days to check out our collaboration projects! 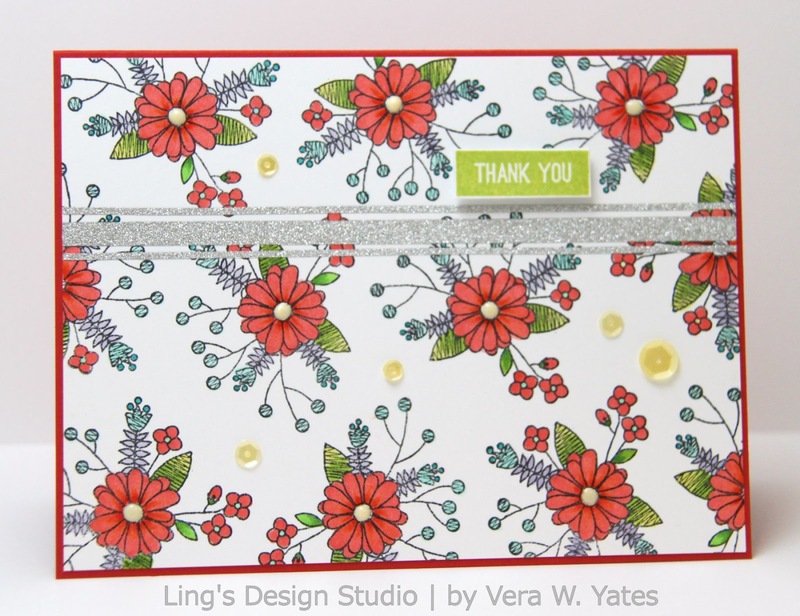 Here's my 1st card using So Suzy Line Leaf 3 and part of The Ton Stamps Wild Cherry Blossoms. 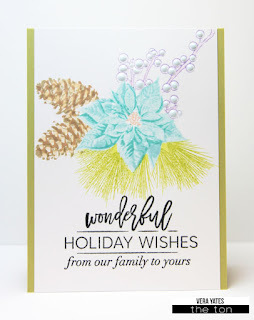 I stamped the images repeatedly, colored the leaves with Copic marker and stencil circle around the flower center. Once all the coloring done, I die cut the "Thank You" sentiment from The Ton and layered it 3 times to make it stand out a bit. 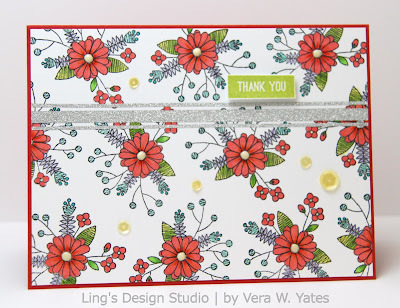 I am needing quite a few thank you cards, so my 2nd card is also a thank you card, but this time I used So Suzy Flower Doodle Single with sentiment from The Ton Basic Labels. 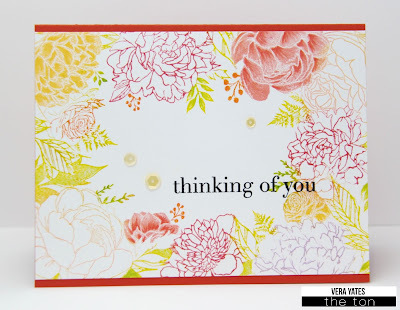 The glitter strips are The Ton Adhesive Glitter Paper. I love that I can add glitter with no mess!! Finish the can with some Yellow Belly Sequins. I hope you enjoy the hop. Here's a complete list of the hop participants. Thank you for stopping by here. I want to really thank you all for all the support. This blog hop is our most successful one to date and from all of us Caring Hearts we thank you for your support. As of right now, I think we already have about 13,000 cards all around. Congratulation, Cheryl. Please email me and I'll get your gc code to you ASAP. Thank you gain everyone! 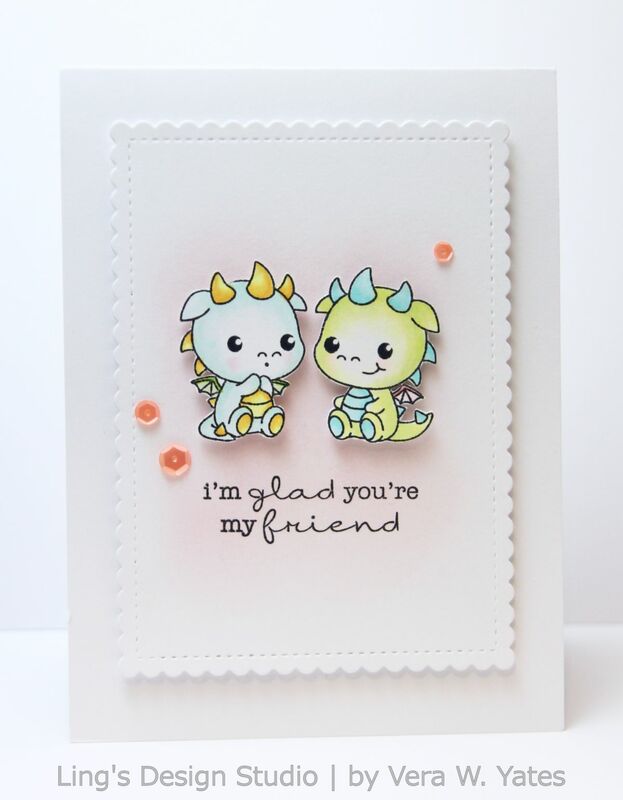 So, this past Sunday, to celebrate World Kindness Day, Jennifer McGuire and I host Caring Hearts Card Drive Blog Hop and all I can say is thank you!! I am humble and grateful for all your support. My email been flooded with question and people expressing interest to contribute. As of today, I have roughly about 4000 cards on my end alone. I am estimating between all the collection place, we probably have about 7000 cards?? Last year we received over 22,000 cards, so I am hoping this year we'll receive just as much. Also, if you know any nursing home that would love to receive these cards, please email me at: wirianta@hotmail.com. I will need to know the nursing home name and number of residents. We continuously adding home to our list. Or maybe you know an elderly that live by themselves, have no family? Let's spread kindness to as many places, to as many people, as possible. 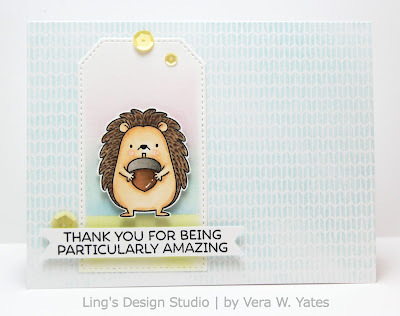 Again, from the bottom of my heart: Thank you for being particularly amazing! 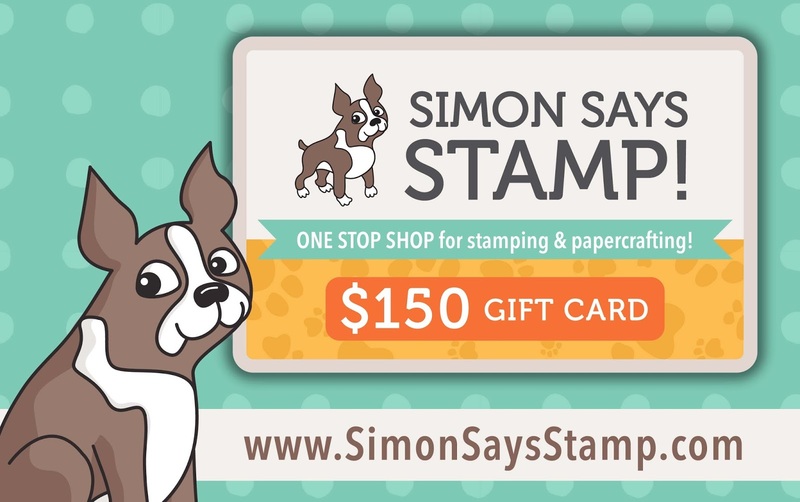 I am making this card for Simon Says Stamps Thanks/Thanksgiving Challenge as they're an amazing, amazing company that always giving back to their community. Do you know that today is World Kindness Day? 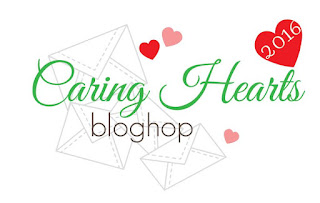 I think our world need to really focus on spreading kindness and since Caring Hearts Card Drive is based on love and kindness, we think today it the perfect day to have our 7th annual Caring Hearts Card Drive Blog Hop. 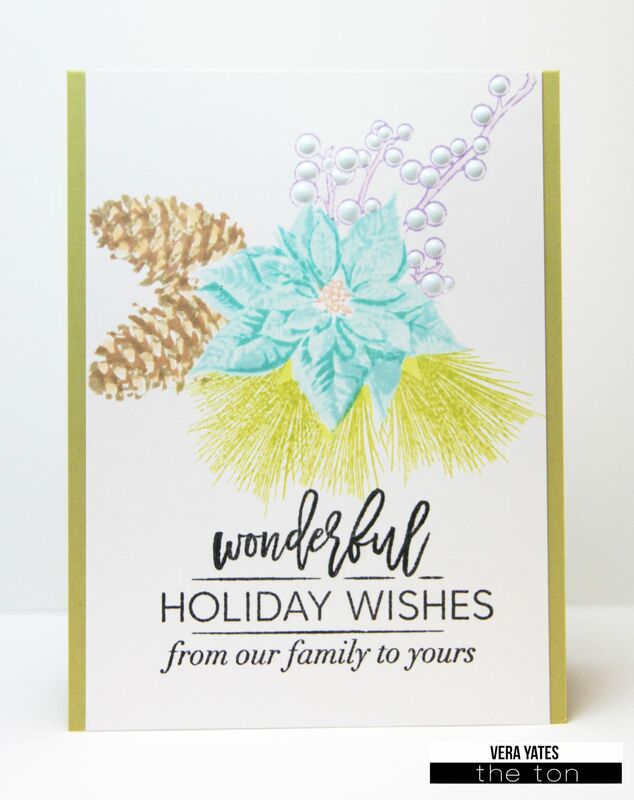 The purpose of this card drive is to collect handmade holiday cards for the elderly that live in nursing homes around the world. 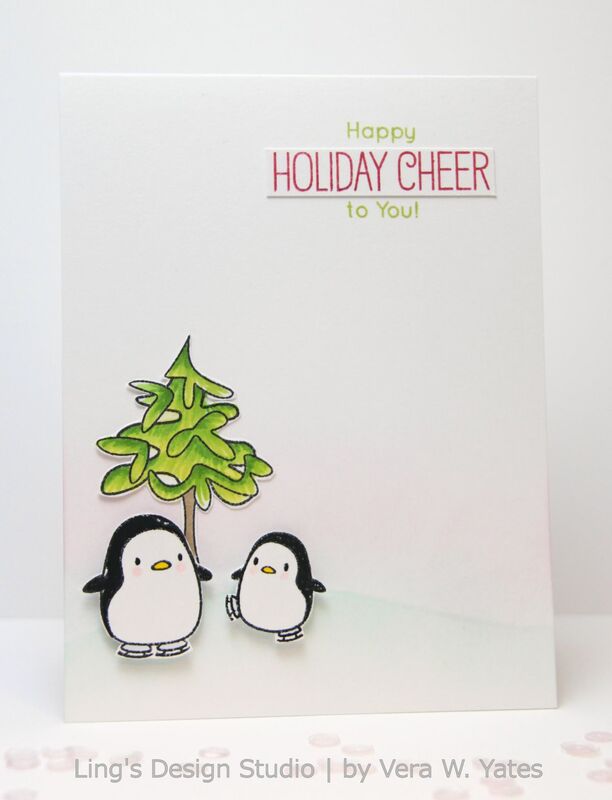 Since 2010 we have been bringing joy to many nursing homes throughout the US, Canada and Australia. And this year, we are branching out to the UK! For this hop, I have made 2 cards. 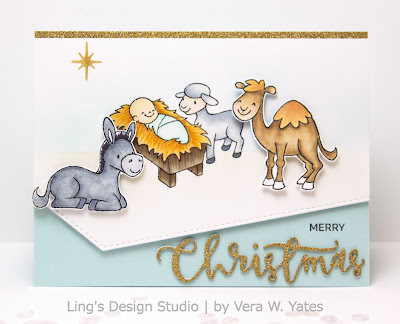 First up is a sweet nativity card that I made using SugarPea Designs Let Us Adore Him set combine with Simon Says Stamp Christmas Blessing dies for the sentiment. My next card is a cutesy one that I sure hope will bring a smile to whoever receive it. 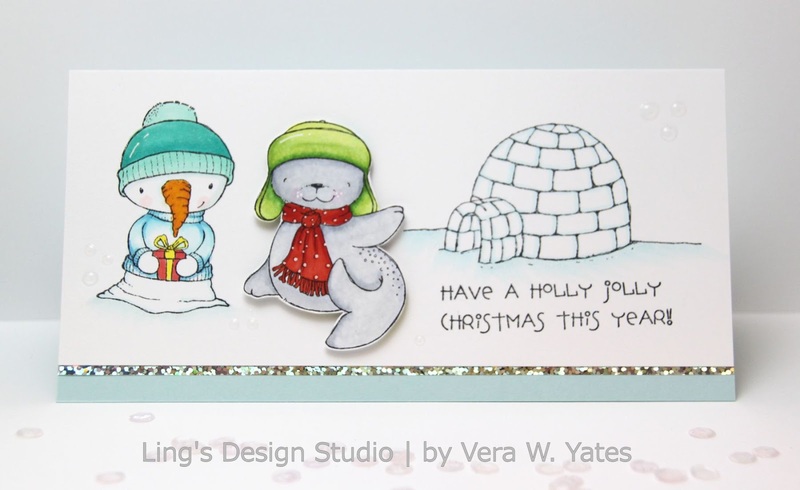 For this one, I use an oldie Mama Elephant Arctic Penguin and the tree is from Simon Says Stamp Color Me Trees set from Believe in the Season collection. I love the funky & unique shape of the tree. The way it all wonky make this clean & simple card fun, don't you think? 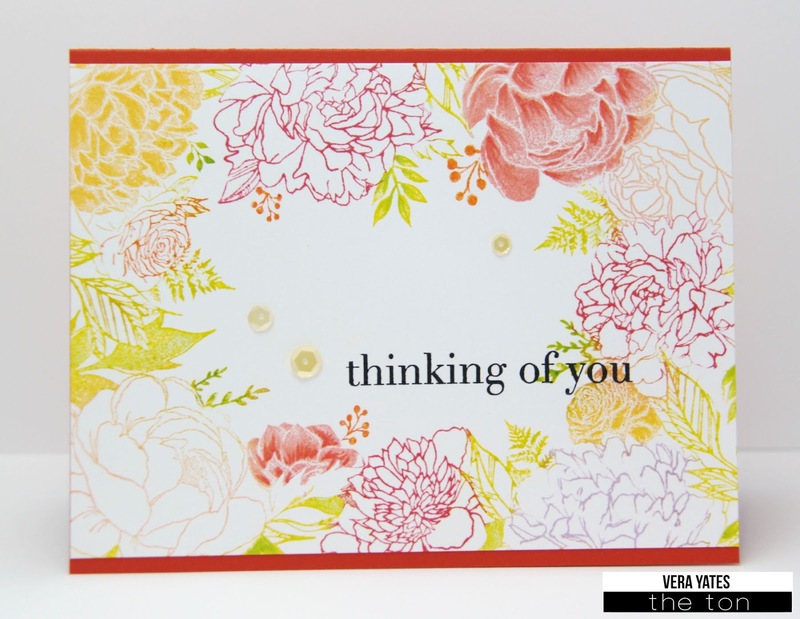 And, one layer card, great for mailing! 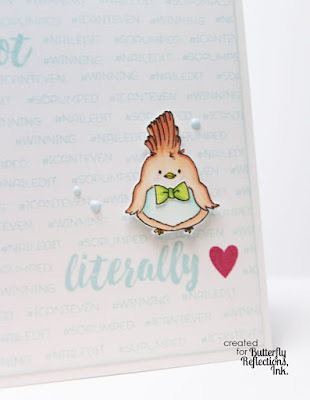 Now, no blog hop is complete without a fun giveaway, right? 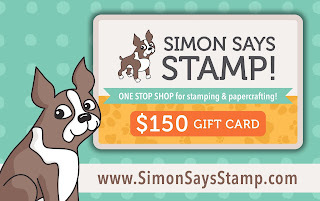 Simon Says Stamp has generously offering $150 gift card for this hop. 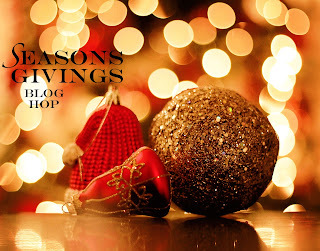 All you need to do is visit and leave comment on each blog. 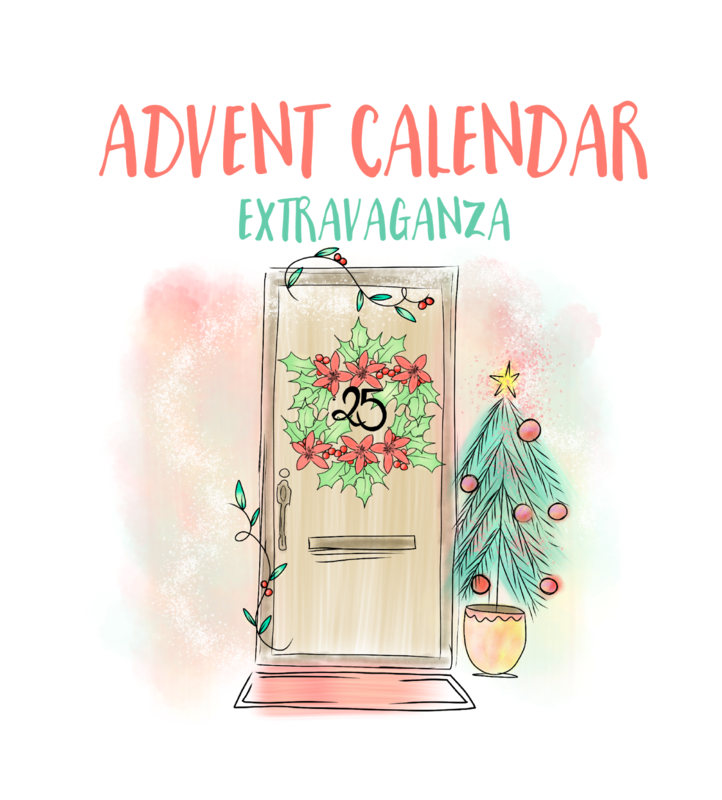 Winner will be randomly selected from one of the participant blog. You have till midnight Thurday, 11/17/2016 to leave comment. 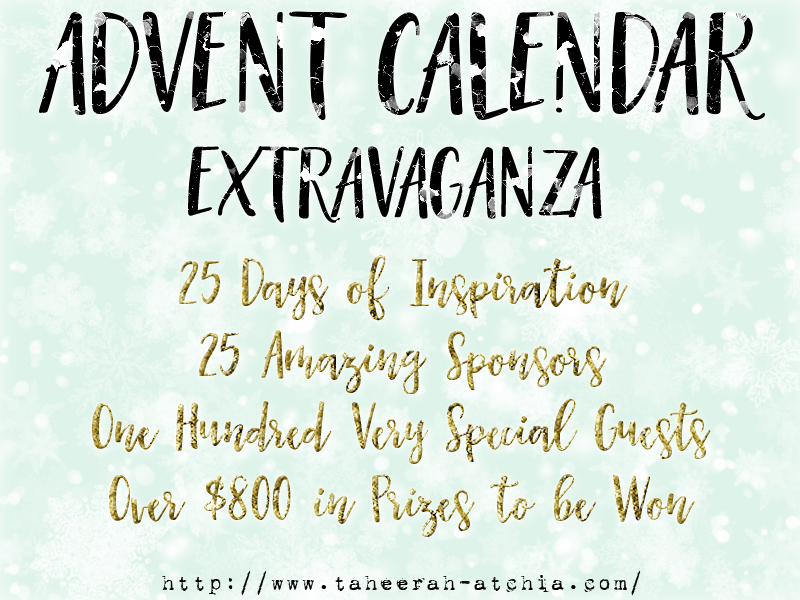 Winner will be announced on here on my blog on Friday, 11/18/2016. 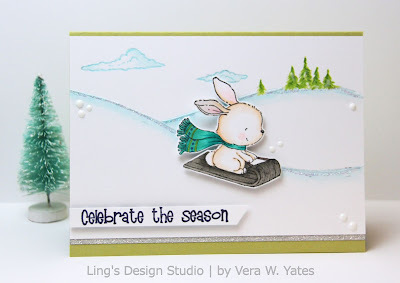 I hope you enjoy this hop and will join our card drive. Every single card counts. Let's share handmade kindness. Let's share kindness period. Let love and kindness be part of our daily life. Have a blessed Sunday everyone. 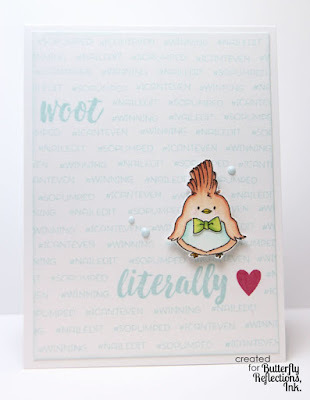 Hi there crafty peeps! It’s time again for our Sweet2Repeat Blog Hop ! Now that so many of you have our Holiday Release in your hot little hands, our Pod Squad of designers have geared up to inspire you with even MORE creative possibilities featuring our newest and hottest products! 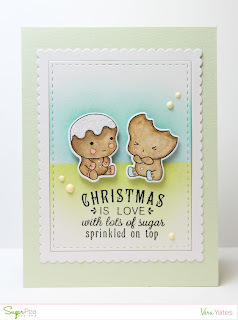 Here's my card using the cute GingerSnaps set with its matching dies. For the frame I used the frame dies from Birthday Journal Card set. 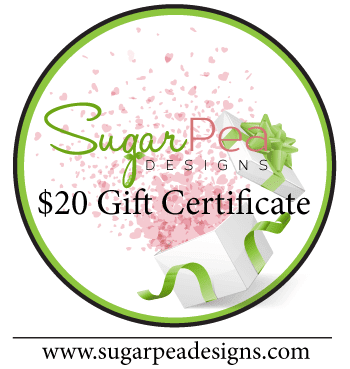 Now, how would you like to WIN a $20 gift certificate to spend on some SugarPea Designs of your own? 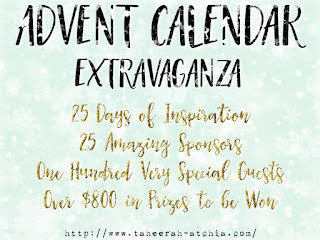 Please visit with each of our design team members and leave a comment for your chance to win! 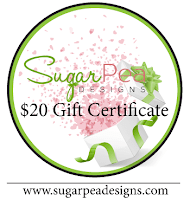 Please check out SugarPea Designs Blog. 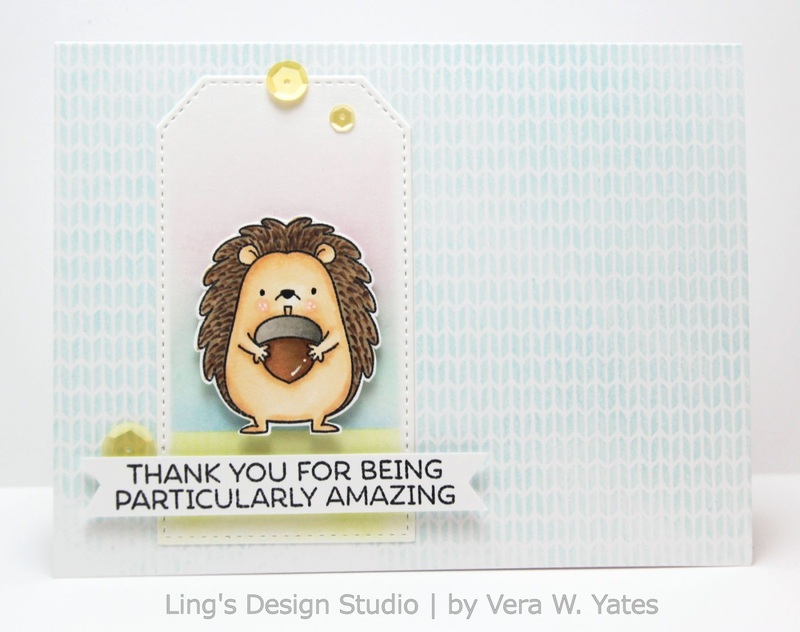 Thank you for stopping by here! Happy Friday! Hi peeps. Quick post. I have one more card featuring the new Stacey Yacula stamp from Purple Onion Designs. Introducing Hope the bunny who loves sledding! As I said, short one. May your Tuesday be a blessed one. Hi peeps. Happy Monday. 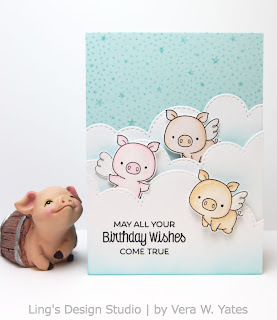 Today, I want to share a couple cards that I made for Purple Onion Designs. 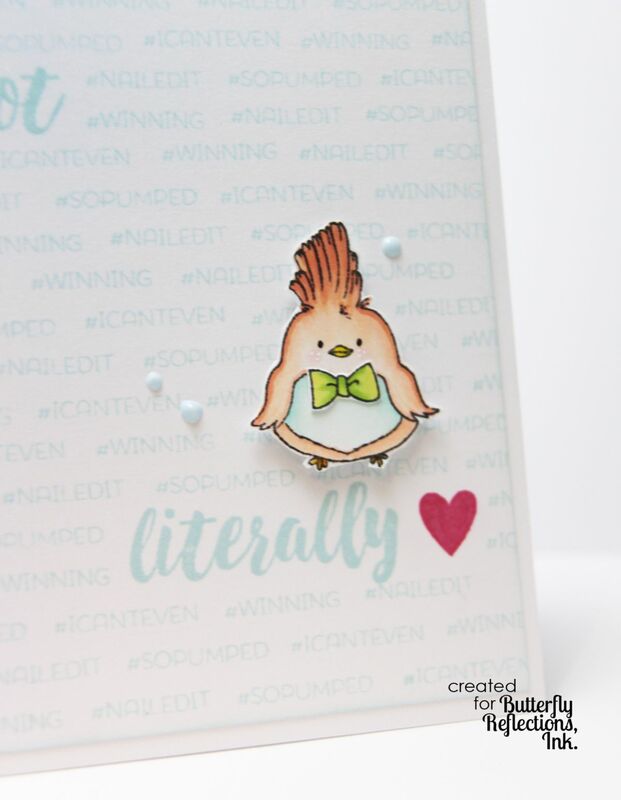 This first card, I shared on Instagram a couple days ago, but I haven't add it here. 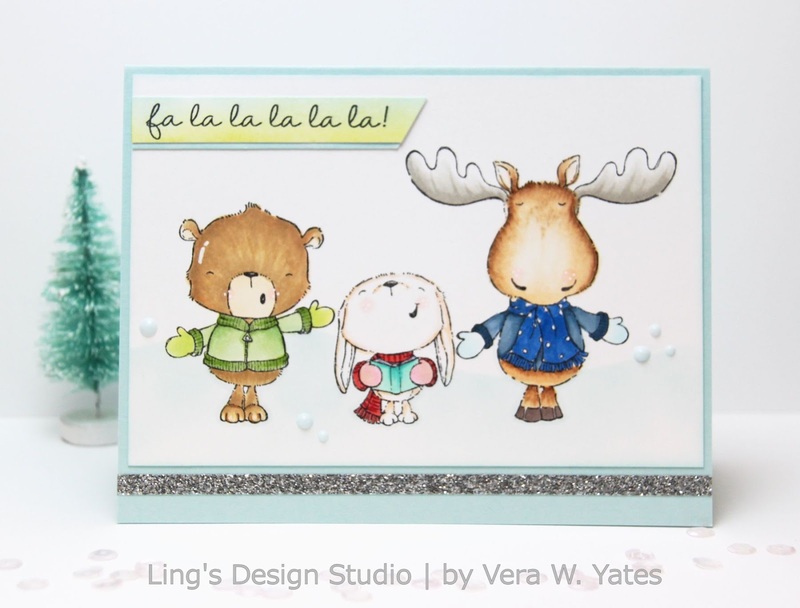 How cute are these singing trio? 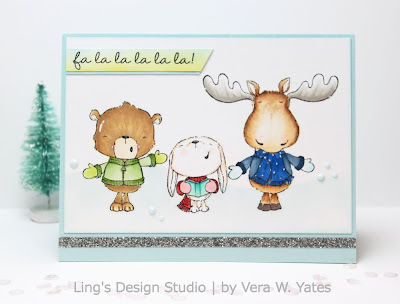 From left to right: Noel the bear, Snowball the bunny and Spruce the moose. 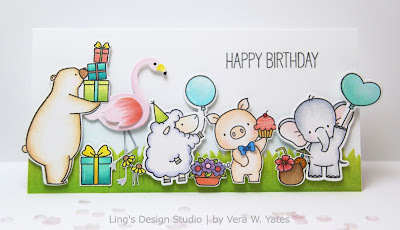 I sure get to practice my coloring with these cute stamps. 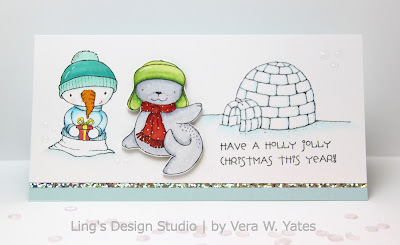 Next, is another fun card featuring Flurry the snowman and Snow Cap the seal. 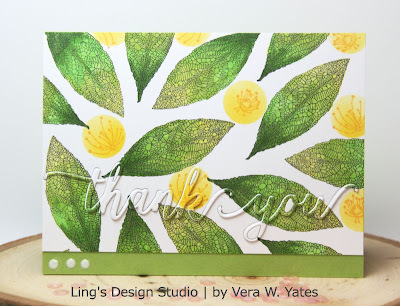 While making this card, I am reminded that I needed to do long card more often. It's a fun size to work with. Now, a quick reminder. You can purchase the complete collection (all 22 stamps) for only $90.00 until Thursday, November 10th. This is more than a 30% saving. 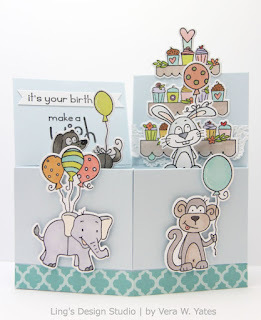 All the new stamps is available now on Purple Onion Designs Shop.